CONEY ISLAND – Life can be complicated, getting your High School Equivalency Diploma (HSE/GED) should not be. However, there are more than 2.2 million adults in NYC today who lack a high school diploma, English language proficiency, or both, according to Ira Yankwitt, Executive Director of the Literacy Assistance Center, who co-authored Investing in Quality: A Blueprint for Adult Literacy Programs and Funders. These free classes, available thanks to Opportunities for Better Tomorrow and local Councilmember Mark Treyger, are available to folks 21 and older and offer food, childcare, case management, and assistance with job placement as well. 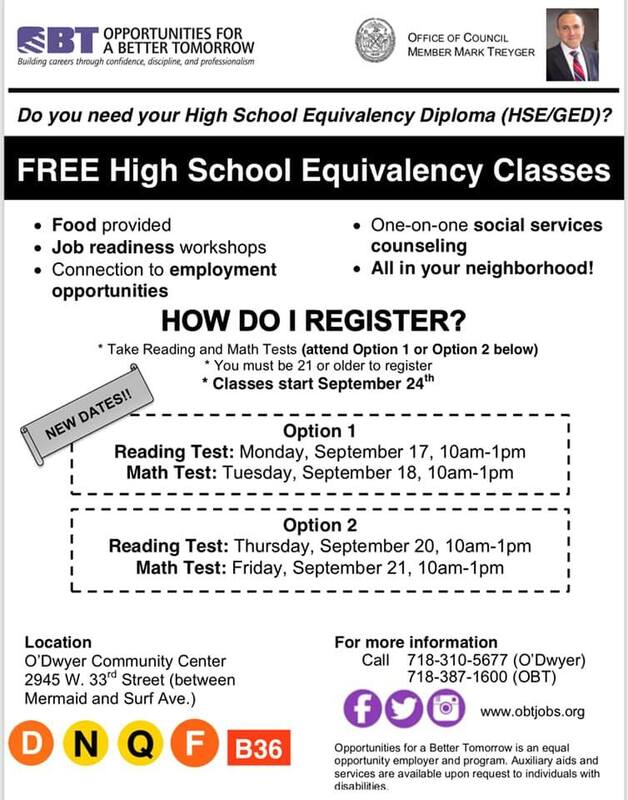 Come by O’Dyer Community Center (2945 W33rd Street between Mermaid and Surf) – classes start at the end of September, and placement tests are sooner – see the flier and pass along to someone who could benefit! “It is never too late to get a diploma, to empower yourself and your family, and to build greater capacity for a successful and lasting career,” said Treyger, who also chairs the City Council’s Committee on Education. “A high school diploma is a non-negotiable credential necessary to obtain better jobs with better wages and benefits. There have been many economic and social barriers and pressures holding many people back from reaching their full potential, but we are in the business of breaking those barriers.